Great golf on the Great Lakes of Sodus Bay. Adjacent to the cool clear waters of Lake Ontario, nestles a golfer's dream course – Sodus Bay Heights Golf Club – one of the state's finest – and best kept secrets. 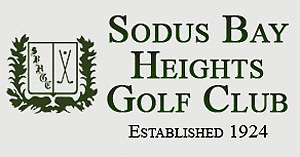 A little known golf course gem, Sodus Bay Heights Golf Club is rich in history, as is it's neighboring town, Sodus Point. Both offer great golf and local flavor for a new player or returning visitor alike. Sodus Point is half way between Rochester and Syracuse, a short drive from each city. The town is located on the shore of Great Sodus Bay, the Crown Jewel of Lake Ontario, an ideal backdrop for a championship golf course The course features a rolling terrain, with large undulating greens. There are many downhill, sidehill and uphill lies. So you'll be challenged to hit shots from a number of intriguing positions. There are water hazards on four holes, with a creek cutting across the fairways and forming a pond at one end. A number of green and fairway bunkers add additional hazards. Sodus Heights Golf Club began as a private nine hole course in 1924 and was renovated with an additional nine holes added in 1969. It welcomes all golfers today to enjoy exceptional golf on a spectacular lakeside course. It's championship caliber golf amidst the beautiful lakeside scenery, a glorious Great Lake golfing experience that's second to none.